Blake grew up hunting and filming whitetails in central Illinois. It wasn’t until 6 years ago, when he went waterfowl hunting for the first time, that he became addicted to duck hunting and goose hunting during the Fall and Winter months. From the help of his friends, he has gained a ton of knowledge in these few short years, but still has a lifetime of knowledge to learn. 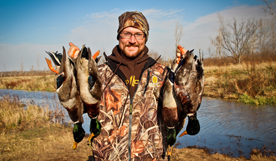 With some knowledge of videography and editing, he created the Fowled Reality concept as a way to document the reality of waterfowl hunting.